Icom produces four different repeater modules and one controller in their DSTAR product line. One controller can serve any mix of four repeater modules. The repeaters start out as basic FM radio sets with traditional transmitter and receiver components and look to be constructed using ID-1 mobile radio chassis components. Each receiver has a traditional FM detector and provides a test point for discriminator or wide bandwidth recovered audio. Each transmitter uses a semi standard press to talk line called TXE and is equipped with a direct FM varactor diode modulator. There are several tests commonly performed with analog FM repeaters that are also useful in testing DSTAR repeaters. The repeater module test points, however, are not readily accessible as shipped. Therefore a few simple modifications need to be performed. Effective Sensitivity, is a measure of how much noise the repeater's surroundings introduce and impair receiver performance. The second test, Receiver Desensitization, will measure the degree to which the repeater transmitter impairs receiver performance. Some test equipment is needed to measure Effective Sensitivity. You will need a signal source or generator, an Isolated TEE or cross coupler with at least 50 dB of isolation, and a 50 Ohm dummy load. The purpose of the Isolated TEE is to inject a known signal into the receive port without significantly loading any signal presented by the antenna. (In duplex antenna systems this isolation allows you to operate the transmitter without damaging the signal generator). A 50 Ohm dummy load is used as a quiet antenna to establish a reference point, (receiver noise floor). You need to be able to monitor the received signal either with a loudspeaker or a tap into the discriminator of the receiver. It is helpful to have a means of measuring the quality of the received signal such as a SINADDER (Signal to Noise and Distortion Meter) or a Flat Meter to measure the degree of receiver quieting when a signal is applied to the receiver antenna port. The industry accepted standards for a usable received signal is 12 dB SINAD or 20 dB of Receiver Quieting. I prefer SINAD because it gives a better overall measure of performance and includes distortion as well as quieting. A signal with 12 dB SINAD will have some noise but will be intelligible. These tests and modifications do not address digital signal recovery or regeneration or bit error rate performance. They do provide a means of identifying and measuring interference sources and system degradation ahead of the digital circuitry. Connect the SINAD meter to the receive discriminator test port or loudspeaker. Note: without a signal at the antenna there should be zero dB. of SINAD – all noise. Connect the receive antenna port to the Isolated TEE and terminate the TEE into a 50 Ohm load. Connect the signal generator to the isolated tap on the TEE and set the generator to produce an on frequency signal at a level of around -60 dBm modulated in FM with a 1000 Hertz tone and the frequency deviation set to +/- 1.5 kHz deviation (1000 Hz. @ +/- 1.5 kHz is a standard 60% full system deviation test tone). Fine adjust the generator output to produce a 12 dB SINAD on the received signal quality meter. Make note of the generator output level needed for 12 dB SINAD. This number, minus the coupling loss in the Isolated TEE is the receiver sensitivity for 12 dB. SINAD. This should be around - 115 dBm or so. (The +/- 1.5 kHz. FM deviation setting is consistent with 60% modulation on 12.5 kHz bandwidth FM receiver systems). Remove any receiver preamplifiers before testing. Using a preamplifier will make existing problems more pronounced. Test without preamplifiers first, then if all is well, add the preamp and re-test. Next remove the dummy load and connect the station antenna in its place. The signal from the generator will now have some real world noise to contend with that should cause more signal from the generator to be needed for the same 12 dB SINAD reading on the signal quality meter. It is not uncommon to see an impairment of several dB caused by outside noise sources. If you are using a single antenna and duplexer the Isolated TEE goes on the Antenna Port of the Duplexer because both local noise and the desired signal mix before the signal gets to the duplexer. I did encounter an unexpected result at this point. The signal from the generator into the TEE was well above the noise, and suddenly the test tone disappeared and a steady burst of noise took over. This happened several times. I finally figured out by listening to the IC91 that one of the local hams was making a call through the repeater. 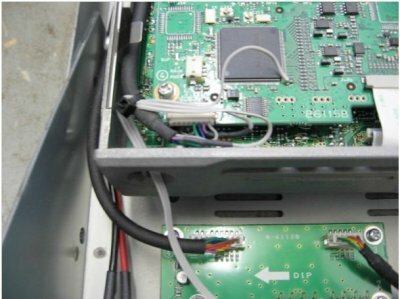 Finally you will need to turn the DSTAR Repeater transmitter on and off to see if additional impairment is caused when the transmitter is active. Receiver Desensitization to be performed. The Receiver Desensitization test is the same as the Effective Sensitivity test except you turn the repeater's transmitter off and on to see if your own transmitter is causing impairment to your receiver. Try this first without any external power amplifiers. If there isreceiver desensitization without an external power amplifier, fix that problem first, then test with the amplifier. Also go back to the dummy load (capable of absorbing the transmitters rated output) and switch between the dummy load and antenna. This will let you know whether receiver desensitization is taking place inside the repeater and duplexer system, or in the transmission line and antenna system. One system operator recommends using DPLUS with a local terminal to play a message through the repeater, thereby turning on the transmitter. I also have used my IC91 with a dummy load (to keep stray RF down) on 2M to operate the 70CM transmitter. For me the PTT modification was convenient, but there are certainly other ways to activate the repeater's transmitter. There are many online lists with advice and information (some useful) about resolving interference and noise problems and I will not attempt to go into these details. 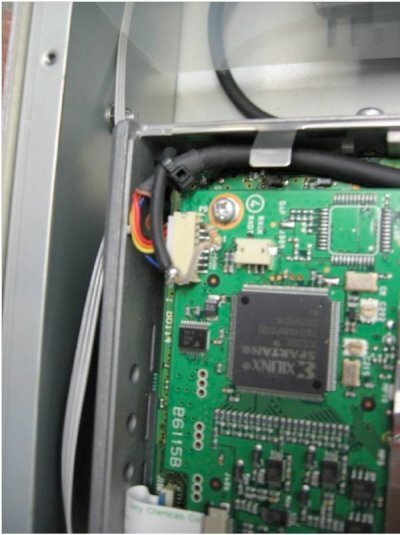 Repeater Modifications – NOT APPROVED by ICOM and MAY CAUSE DAMAGE to your REPEATER. DO THIS AT YOUR OWN RISK! There is no warranty implied or offered and your mileage may vary. Figure 1 above is the 1.2 GHz RP2V DSTAR Receiver MOD. 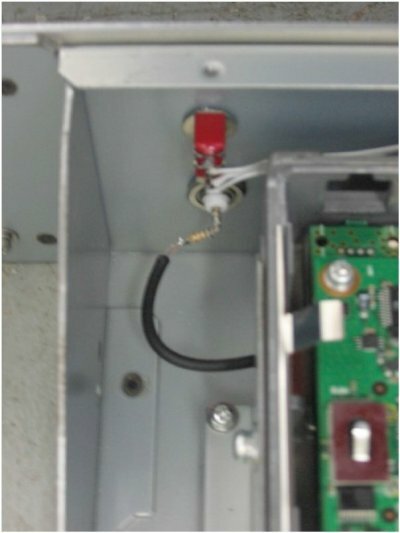 A 68K Ohm resistor is attached to the 8th pin of the internal connector and runs through an opening the front of the receiver to a Chassis Mounted BNC connector mounted in the front panel of the repeater. Figure 2 below is the front panel switch and jack. I found some single throw double throw toggle switches with Momentary ON and Center OFF positions. I mounted this type of switch on the front of each repeater module. VDC source, so the TX Radio cannot transmit. In the NORMAL position the signal from the RP2C goes through the UP position on the switch and lets the controller operate the transmitter as needed. The PTT or Momentary DOWN position on the switch disconnects the control board from the RP2C and Momentarily connects the TX Radio TXE lead to +3.24 VDC to allow momentary keying of the transmitter. I first thought about using diodes to isolate a Manual Key line but I was concerned that the 0.7V drop across the diode junction may be too much to permit reliable keying. The 3 position switch also allows the technician to disconnect the TX line from the controller and prevent accidental TX operation during testing. The procedure is very similar on the 2M and 70CM repeaters except the 3.24 VDC power source that powers the microprocessor is at a slightly different location. That is pretty much it in a nutshell. I recommend that only an experienced technician with reasonable skills attempt this modification with proper ESD protection, and be sure safety measures such as proper fusing, and so forth are applied. Again this is at your own risk and I assume NO LIABILITY if you thrash your repeater. Let the buyer beware.